Crisis management failure: Athens’ Riviera Oil-spill reminded me of all the times I’ve found myself in such great-effect cases. Having a Crisis to manage, is the only time that shows what the organization, entity, or state is really made of. 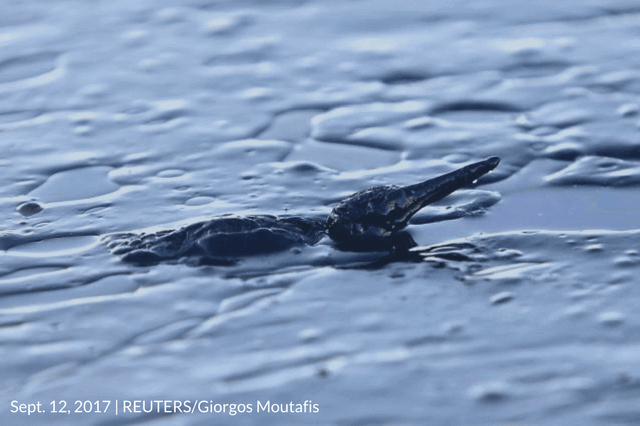 The Greek Athens’ Riviera oil-spill was another case that everything was disordered. Crisis management failure: Athens’ Riviera Oil-spill reminded me of all the times I’ve found myself in such great-effect cases. Having a Crisis to manage, is the only time that shows what the organization, entity, or state are really made of. 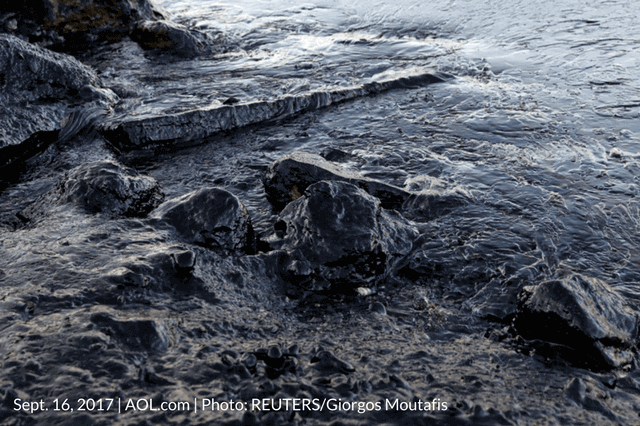 The Athens’ Riviera oil-spill is another case where everything and everyone were in disorder. See the images below, and you’ll get the words…. It was a really warm, sweet Sunday in September. The thermometer showed 34-35 degrees Celsius. What a perfect day for a swim in Athens Riviera, you could say. If only… The “Agia Zoni II”, a 45-year-old oil tanker, sank early Sunday morning near the island of Salamis, about seven miles from the country’s main port, Piraeus. It was carrying more than 2,500 metric tons of fuel oil and marine gas oil. Officials said that the leak (…leak!) is contained near the area of the shipwreck. No crisis ‘sirenes’. “Unconfirmed” info spread, that it soon expanded to the coastline area known as the Athens Riviera. Nearby beaches were soiled by the oil, but officials believed it could be contained given mild wind predictions. Five days passed on, to see that the oil spill was drifting miles away. 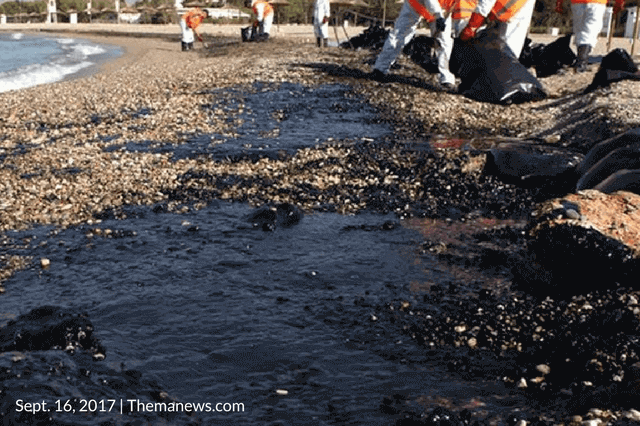 The much-loved beaches of Glyfada, Voula and Vouliagmeni were covered by the thick black tide. A ‘buzz’ started. Media reports. Politicians accusing media of exaggeration. Opposition accusations, officials disappearing from the scene and environmental groups, like WWF, complained that officials bungled their response to the spill, saying it was allowed to spread out of control. The Piraeus prosecutor has brought criminal charges against shipowner and Captain of “Agia Zoni II”. Mayors were excusing themselves “if someone had warned us even on Tuesday, we would have taken precautions.” No one took the responsibility… The coast guard said authorities had sealed the shipwreck on Tuesday and there was no further spillage. How come? 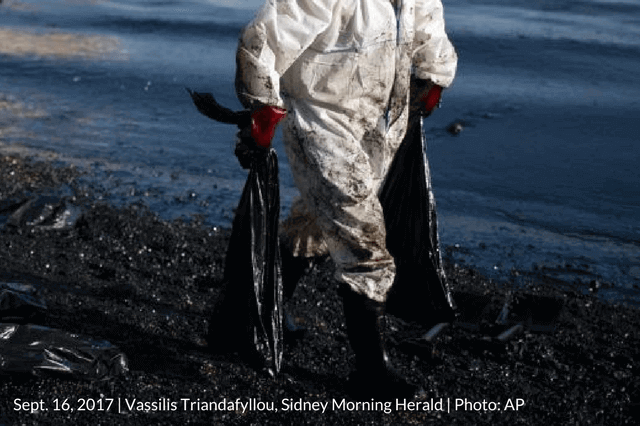 In one of the worst ecological crisis that ever occurred to the Athens Riviera, the oil spill didn’t only test the mediocre state emergency plans, but it also turned naked the political and authorities’ Leadership. It was a big oil spill. Impact on surface and grounds. No one prepared civil society on precautions, response actions and possible health and security risks. It affected the coastline where Greeks enjoy their swim several months of the year and indirectly the tourism industry. Limited alert systems, slow reaction times, no emergency team in place, same time. In my kind of profession, we often say that Leadership is measured against major Crisis. What really this means, is that at tough times audiences see who exemplifies Truth, Ethics, Transparency, and Responsibility through information, hard work, and actionable response implementation. Immediately you call and set up in place the Crisis Management & Security team. The plan says that every function with a contributing input and shared responsibility is a member of the team. From CEO to Health & safety, HR, Experts, Technical people and so on. Do the math what didn’t work in the Athens’ Riviera oil spill. The team has a scenario plan at hand. Mobilizes all support teams to assess how serious the situation is. Then, you acknowledge, sharing the truth with constituents and stakeholders. You inform even every hour (if it is of a grave nature), and you deliver true suggestions, policies, advice to the affected stakeholders; in this case citizens, kids, schools etc. Leadership is visible, proximate to the extend that serves a higher (protective) purpose. In Crisis Management, be quick with the facts, slow with the blame. The Greek PM, Ministers, Naval officers, Ministry experts, Sourcing teams, Seafarer, Head of Coastal guards, and all officially assigned civil protection advisors were all hiding, avoiding to be part of the so-called ‘blame-game’. Where’s leadership, responsibility, ethical stance? In times of Crisis, you can’t protect yourself, your name, your brand in the safety zone. You should exemplify an ethical stance, accept the issue, and give a clear reaction plan. You can’t pass through with a press reactive written statement. It was clear that no real crisis management plan existed. As it happens when a company is accused of a product fault and delays its actual responses for some days. They think that passing time might lower the issue’s impact. No, it doesn’t. Crisis management steps are the same no matter the case: a coordination unit comprised by all associated units, the special advisory team on legal, engineering, safety, communications etc, and one (real) specialist in charge. If you are a Minister, step aside; you don’t know anything on the subject. If you are the CEO step aside if the crisis is about food poisoning. If you are the owner, step aside, if the crisis is a cyber attack. Secondly, when your crisis is impacting an entire society’s group (like the Athens’ citizens) your communication policy is critical: responsible answers, truthful data, timely information dissemination every hour. Out of your ethics and brand culture (in the Athens’ Riviera crisis case these are questionable since politicians are involved), you don’t let room for speculation, BS word-of-mouth, and irresponsible explanations. Because communications are not aiming to turn your public image into favoritism, but to protect stakeholders (fishermen, leisure groups, businesses, kids etc). In tough times, whether it’s a state, company, brand, what the stakeholder audiences see is who’s really exemplifying Truth, Ethics, Transparency, and Responsibility through information, hard work, and actionable response. The oil spill might be cleared in some months’ time, but the citizens’ perception will not ever clear from the fear that they have an irresponsible leadership to protect them. Once a customer of mine for a food poison case, reported by a mother to the food control authority, proposed to me that we should fight against the publicized story by promoting partner’s “quality assurance” evidence. And(!) do it with paid media. I resigned from the project. It was a decision cloning from within, with a single thought: should I be such a man? 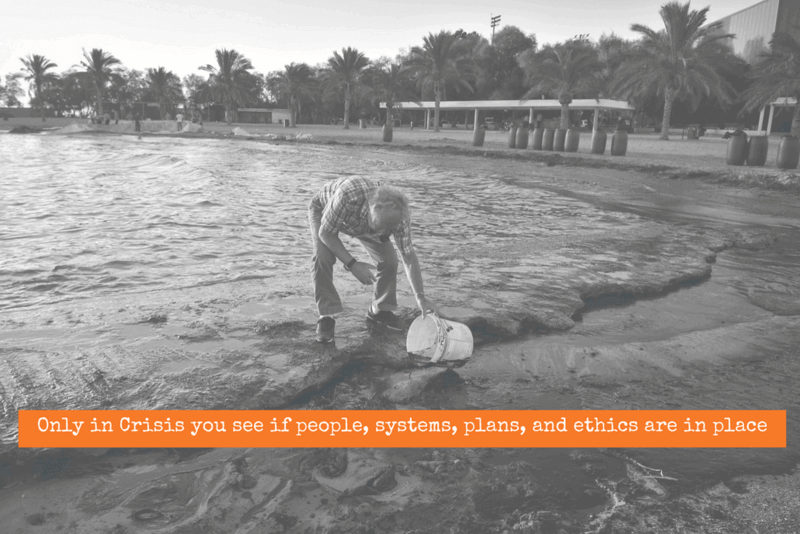 I’ve been so many times involved in Crisis response projects (oil spill, ship, food poison, river pollution, etc) and it was always about brave leadership and hard-working people trying to solve or respond to the issue at hand. If you don’t choose to do the right thing / plan / process / quality assurance / safety system before hard times reach you, you will most certainly do it in Crisis management time down the road with multiple costs and negative pressure. So I’m entitled to ask, as a tax-payer, what kind of men are those guys being responsible to mitigate (on our best interest) natural, man-made, economic, social disasters? I believe I won’t (and we all won’t) get any concrete answers on this. Six trillion Growth opportunity and the narrow attention span Borrow My Brain blog Borrow My Brain blog Brand loyalty and market shares in decline?